Harry Potter and the Cursed Child - Parts One and Two | Rakuten Kobo. Great ending to all the harry potter books but i EXTREMELY suggest that you read all the other harry potter books in order befor reading this. 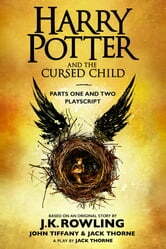 Congrats to J.K. Rowling for finishing off the best series ever! Except i hope this isnt the end of the harry potter series forever. How can anyone not like this book?! ?